Information and Communication Technology (ICT) has become an irreplaceable component of practically every aspect of human activity with its impact buttressed by the omnipresent internet. While the developed world thrives on ICT capabilities, the developing economies are using it for leapfrogging into new levels of technological advancement. Modern ICT systems are made up of a complicated mix of people, networks, hardware and software. As their spread is increasing rapidly, issues such as energy, environment and related aspects have to be addressed ensure user satisfaction without damaging the ecosystem. This chapter focuses on green ICT aims to study and practice use of computers and other ICT resources efficiently laying stress on factors like reduction of hazardous components, maximization of energy efficiency, enhancing re-cyclability and biodegradability. We all recognize the critical importance of Information and Communication Technology (ICT) both as a large consumer of energy and primary resources and as an enabler for environmental and cultural change. In line with the definition for Carbon Neutrality, the energy consumption of ICT on the office estate will be Carbon Neutral. ICT will be carbon neutral across its lifecycle. However the Green ICT agenda is not just about energy efficient ICT, ICT can also be used to generate environmental benefits elsewhere in other operations. It is a key enabler for most programmes and it should play a major part in reducing carbon emissions from other areas of all activity, for example through enabling tele conferencing and video conferencing, remote and home working. The government should work with industry and draw up evidence-based proposals for improving the sustainability of ICT used both in-house and in out-sourced contracts with service providers. 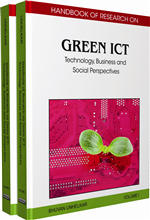 Green ICT or Green Computing: It refers to environmentally sustainable computing or IT. Biodiesel: It is a cleaner-burning diesel fuel made from natural, renewable sources such as vegetable oils. Biodegradable: Material that, left to it-self, will be decomposed by natural processes. Videoconference: A teleconference conducted via television equipment. Carbon Neutral: Emitting no carbon dioxide into the atmosphere.